Top-rated drum app in "101 Amazing Apps" issue, 9/10. "...totally goes beyond my expectations.... flexible yet idiot-proof..."
"... one gorgeous-looking iPhone app...."
"...as well as looking great, DrumTrack8 is a spiffy drum machine for your iPhone...."
Simple Is Beautiful's DrumTrack8© is a Drum Step Sequencer for the iPhone and iPod Touch NOW AVAILABLE in the iTunes App Store. DrumTrack8 lets you compose 16-step patterns of drum fills and breaks, as well as organize patterns into full length songs. Modify Pattern Step velocity, sample offset, pan and pitch in an intuitive, multi-touch interface. Define your BPM by tapping or with a slider. Shake your iPhone to clear a Pattern. New in V 1.5: Create patterns of < 16 steps with Pattern Length Edition. New in V 1.8.1: Track title/instrument slide-out panel. New in V 2.0: Create custom drum kits from existing samples or import your own samples. New in V 2.5: Change signatures and pattern length in the Toobar. Change a Pattern’s drum kit and adjust master track values in the Mixer. Several Drum Kits are provided, primarily vintage electronic drum kits (like the 808, 909, LM1 and much more) but also HipHop, Jazz and Rock Kits. Two chromatic instruments (Bell and Sitar) round out the offering, expanding DrumTrack8 to traditional composing as well. New in V 2.1: Optimized mixer panel interface and new Kit Selection Panel. Create new patterns and string them together to create your song. 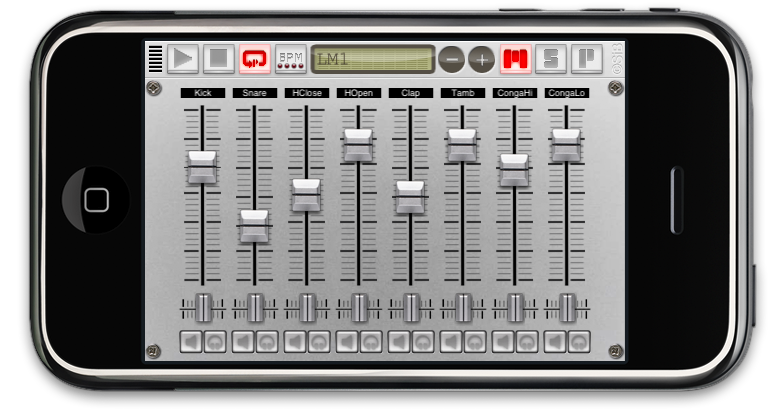 Play the whole song, or interactively trigger one pattern a time and change mixing parameters for live performances. Save your songs for later use. New in V1.4: Email a pattern in General Midi format to import it in the DAW of your choice. 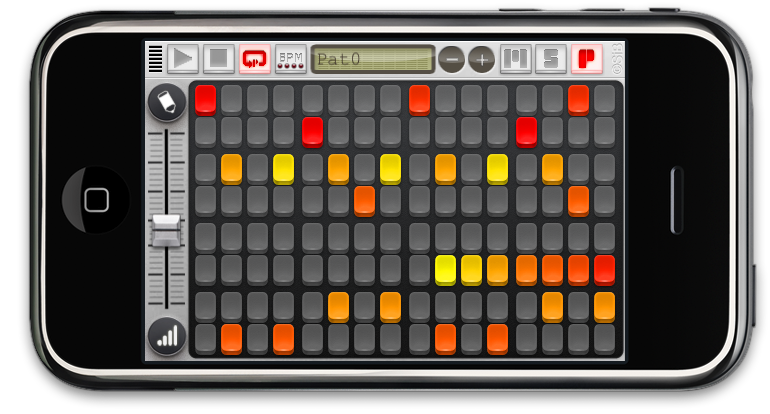 New in V1.6: Continue playing the song when the screen is locked, to serve as a drum kit for practice sessions. Supports AudioCopy* (FourTracks) and Intua (BeatMaker) public pasteboard methods, allowing users to export Pattern and song audio files to many compatible apps. Export/email pattern in WAV and MIDI format and song in WAV format. New in V2.4: Upload Songs and Patterns to SoundCloud and Email Song in Midi. Signatures and Pattern Length on toolbar replaces Pattern Length button on Pattern Panel. Fixed crash on iOS 5 (stereo sound handling). Fixed Retina Display color problems. Corrected mail wav/midi missing file extension. Swing Slider in the newly expanded Toolbar. - 2.3 is incompatible with the iPad and OS 3.2, so do not upgrade. - Mute and Solo bug in the Mixer Panel. Compatability with iPhone OS 3.0 and upwards. Supports AudioCopy* and Intua public pasteboard methods, allowing users to copy Pattern audio files between compatible apps. Email/export pattern in WAV as well as MIDI. Greatly improved audio engine, removing glitches at low pitch. Now continues playing when screen is locked. Email/export a pattern in General MIDI format to import in the DAW of your choice.